LEGO builder Michał Kaźmierczak found the best place for gray LEGO pieces. 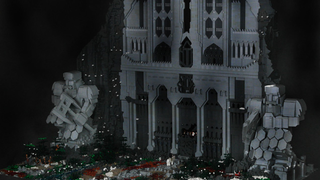 He built a huge version of the dwarven fortress Erebor from The Hobbit and The Lord of the Rings series. The project consumed 55,000 bricks, and it took 7 months to complete it. But as you can see the 5-foot-tall result is truly awesome. Bard the Bowman and the dwarves meet in front of the gates of Erebor, right before the battle begins of the five armies begins. Here’s a pic with the creator, just to show how big this set really is. There’s also an interior, and it’s just as incredible as the front. According to the creator, a single dwarf statue weights more than 13 pounds, and it’s bigger than the official LEGO Death Star set.